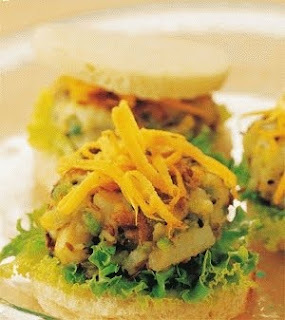 A filling and nutritious snack, small twist to Bombay Sandwich... and lip smacking tasty to boot! This quick snack has the goodness of vegetables and whole bread. Cut the potatoes into very small pieces. Heat the oil and fry the cumin seeds until they turn brown. Add the green chillies and fry again for a while. Add the remaining ingredients and mix well. Allow the mixture to cool a little. Divide the mixture into 5 equal portions. Keep aside. Cut each brown bread slice into a round. Apply butter on one side of 5 bread rounds and tomato ketchup on one side of remaining 5 bread rounds. Put the potato filling on the buttered side of each bread round. Sprinkle grated carrots and lettuce on side of another bread round.